In The Spotlight, Inc.: Good News! 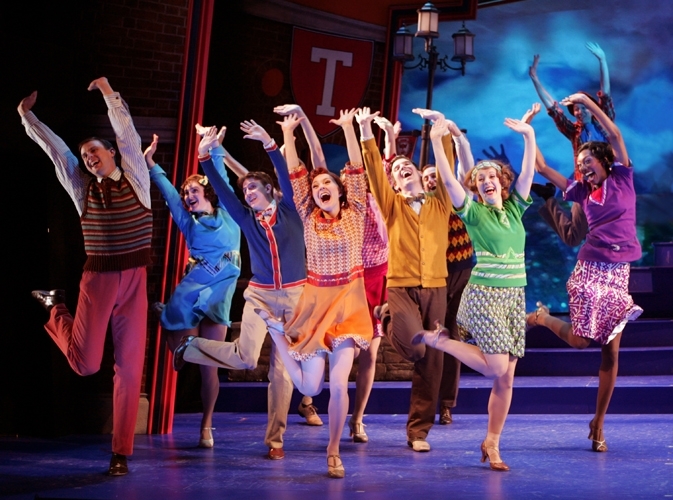 "Good News" is the musical theatre equivalent of comfort food: familiar, pleasing, and it fills you will smiles. Just to prove that this is an true song and dance show, the night begins with a choreographed overture complete with tap dancing football players. The story is slight, and part of the charm: college football hero falls for his astronomy tutor while co-eds frolic and sorority girls swoon. As jock and tutor, leads Ross Lekites and Chelsea Morgan Stock are Gene Kelly and Debbie Reynolds personified. Slapstick sidekick Barry Shafrin (Bobby) displays the rubbery comedic chops of Huntz Hall and Danny Kaye. Shafrin is paired up nicely with Tessa Faye's bombshell Babe O'Day, who countless intermission-goers likened to a young Carol Burnett, with her broad delivery and angular movements. The chemistry is not limited to the youngsters either, as Beth Glover's Professor and Mark Zimmerman's Coach Johnson, prove that the "responsible" adults can get just as moon-faced as the kids. It would be easy to say that the show is filled with musical theatre archetypes, but since the show was first produced in 1927, these characters are really the original molds. Jeremy Desmon's adaptation and Michael O'Flaherty's direction pull off the admirable feat of staging an old fashion show, with modern methods, as a loving homage to itself without being condescending. One mesmerizing feature of the show is the color scheme. While the physical set time is fairly simple, it, and every aspect of the show, has a dazzling color design. Vivid blue backgrounds, vibrant red uniforms, dazzling accents are all enhanced by a saturated lighting palette. The costumes, the make-up, the props, every detail is awash in living colors, making for a singing, dancing rainbow of old fashion entertainment.